traversing rough terrain and transmitting data to a host computer. •	Sufficient on board sensors to enable fully independent decision-making. •	To develop a flexible mobile base unit and core processor suitable for future expansion. •	Duplex linking of the robot to a computer for tele-operation and demonstration purposes. 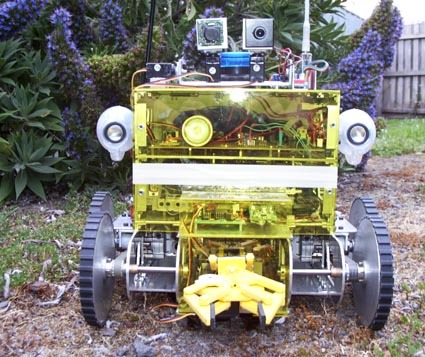 The flexible mobile robot as its names suggests is meant to be flexible in its nature. take about AU$4000 (US$2000) to complete. iBook (Also running OSX)  for tele-operation. Tele-operation software was written specifically for this robot using RealBasic. movement controls, gripper controls and much more.